How Much Better Does Max Payne 3 Look on PC? 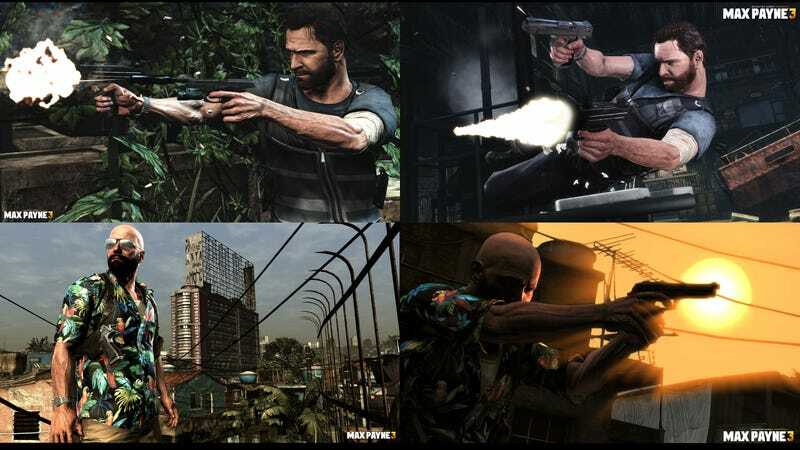 Today's Rockstar released the first images of Max Payne 3 running on PC, and while no exact comparison shots are available, taking a look at similar screens for the console version reveals substantial differences. Just look at the image above. On the left we've got two of the three PC shots released today. On the right, two previously released console shots. All of them look just lovely, of course; this is Rockstar, after all. The PC shots just look crisper and sharper than their console counterparts. It's something PC gamers have come to depend on and expect, given the amount of money we pump into our machines. The differences are most noticeable between the two shots of stubble-tastic Max firing off his weapons. The PC Max seems a bit more 'there' than the console one. Also he has a bit more hair fringe going on at his temple. This could just be due to the dynamic hair fringe system Rockstar is waiting for the right moment to reveal, which I just made up. Still, dynamic hair fringe: we need it. The lack of a similarly-angled bald shot makes it hard to spot the differences between bald Max on the PC (left) and console (right). I really only posted this picture to demonstrate how good that shirt looks on both versions. I need that shirt. I need 10 of them in 2x-large, and I'll wear them every day for the rest of my life. One thing to keep in mind as well is that Rockstar isn't taking screenshots on the sort of machine you likely have sitting on your computer desk. They've likely got Max Payne 3 running on the sort of system you see at trade shows and drool over until you realize it costs as much as a small car. Or at least something better than I have. Definitely not a Compaq Prolinea 425s. When it comes right down to it, graphics don't really matter much when you're down on the ground and an angry enemy is shining a flashlight in your face like some sort of third and final Max Payne 3 screenshot. PC, Xbox 360, and PlayStation 3 Max Paynsylvanians (term coined) should enjoy the game just as much, no matter which platform they employ. Folks that've pumped a couple thousand into a gaming PC will enjoy it a little more just as much.